Crossing or folding the arms or legs suggests that a negative or defensive attitude exists, and this is also the case with the ankle lock gesture. The male version of the ankle lock is often combined with clenched fists resting on the knees or with the hands tightly gripping the arms of the chair (Figure 87). The female version varies slightly; the knees are held together, the feet may be to one side and the hands rest side by side or one on top of the other resting on the upper legs (Figure 88). During more than a decade of interviewing and selling to people, our observation has revealed that, when the interviewee locks his ankles, he is mentally 'biting his lip'. The gesture is one of holding back a negative attitude, emotion, nervousness or fear. For example, a lawyer friend of mine told me that he had often noticed that, just prior to a court hearing, the people who were involved in the case nearly always sat with their ankles tightly locked together. He also found that they had been waiting to say something or had been trying to control their emotional state. When interviewing prospective employees, we noted that most interviewees locked their ankles at some point during the interview, indicating that they were holding back an emotion or attitude. 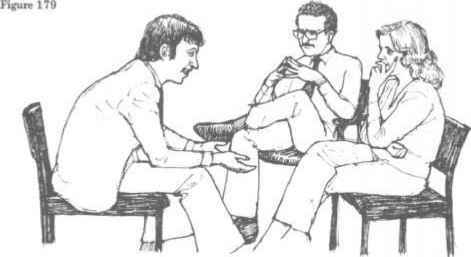 In the initial stages of our research with this gesture, we found that asking questions about the interviewee's feelings was often unsuccessful in unlocking his ankles and thus his mind. We soon discovered, however, that if the interviewer walked around to the interviewee's side of the desk and sat beside him, removing the desk barrier, the interviewee's ankles would often unlock and the conversation took on an open, more personal atmosphere. We were recently advising a company on the effective use of the telephone to contact customers when we met a young man who had the unenviable job of calling customers who had not paid their accounts. We watched him make a number of calls and, although he sounded relaxed, we noticed that his ankles were locked together beneath his chair. I asked, 'How do you enjoy this job?' He replied, 'Fine! It's a lot of fun.' This verbal statement was however, inconsistent with his non-verbal signals, although he did sound quite convincing. 'Are you sure?' I asked. He paused for a moment, unlocked his ankles, turned towards me with open palms and said, 'Well, actually, it drives me crazy!' He then told me that he had received several calls from customers who had been rude to him and he had been holding back his feelings so as not to transmit them to the other customers. Interestingly, we have noticed that sales people who do not enjoy using the telephone sit in the locked ankles position. Leaders in the field of negotiating techniques, Nierenberg and Calero, found that whenever one party locked his ankles during a negotiation it often meant that he was holding back a valuable concession. They found that, by using questioning techniques, they could often encourage him to unlock his ankles and reveal the concession. There are always people who claim that they habitually sit in the ankle lock position, or for that matter, any of the negative arm and leg clusters, because they feel comfortable. If you are one of these people, remember that any arm or leg position will feel comfortable when you have a defensive, negative or reserved attitude. Considering that a negative gesture can increase or prolong a negative attitude, and that other people interpret you as being defensive or negative, you would be well advised to practise using positive and open gestures to improve your self-confidence and relationships with others. Women who were teenagers during the mini-skirt era crossed their legs and ankles for obvious, necessary reasons. 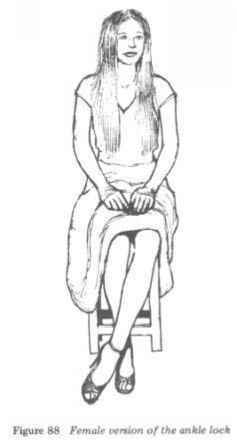 Through habit, many of these women still sit in this position, which may make others misinterpret them; people may react toward these women with caution. It is important to take female fashion trends into consideration, particularly how these may affect the woman's leg positions, before jumping to conclusions. What is the meaning of thenon verbal ankle lock?